Regarding the Mueller investigation with Trump and the collusion with Russia. And I know what the caller meant. He wasn’t asking me, “How is it going to end?” What he wanted to know was, “How can we make it end?” And I’ve asked a bunch of people this question overnight. You know what’s fascinating about it? You talk to people in Washington, even people on our side — even people who are every bit of the same frame of mind we are about this, but they’re in Washington — and once this investigation starts, in their world, there’s no way it ends until the people running it decide it’s over. So when there’s a special counsel investigation or a congressional investigation, there’s nothing anybody can do to stop it. It’s just gonna run its course. So the strategizing takes that into account, dealing with what the potential outcomes are going to be, when it ends, how long it’s gonna be. But last night on the Fox News Channel there was a guest by the name of Fred Fleitz, and it might be Fleitz. I’m not sure. I’ve got a pronounciator here. F-L-Y-T-Z. I guess that’s Fleitz, and Fred Fleitz is a… What is he? 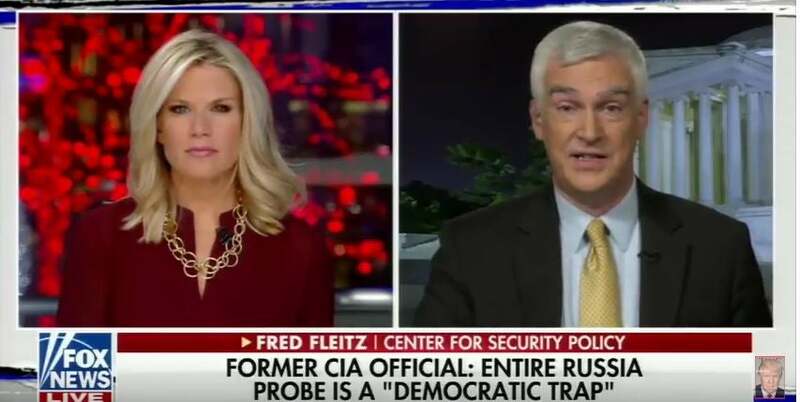 Fred Fleitz is a former CIA analyst, and he was brought on Fox to talk about the Mueller investigation. FLEITZ: The Democrats paid for this dossier, the purpose of which was to set off an FBI investigation. The Trump campaign is made up of outsiders. They’re likely to get caught up in this investigation. After all, when Michael Flynn talked to the FBI, he didn’t have an attorney with him. These last-minute policy decisions by the Obama administration to sanction the Russians? I think it was bait. It was bait to get Trump officials to do something. I think they were being monitored by intelligence agencies. They were looking for evidence to get the Trump transition team with, because I think this was all a trap by the Democrats. If this can be established, I think President Trump should pardon everyone, and I think that’s what Republicans on the Hill should be calling for. RUSH: There is your endgame! A former CIA analyst, Fred Fleitz. Now he’s not saying anything you haven’t heard here. But the fact that he is a former CIA analyst gives him, in my estimation, credibility. He knows exactly what these… He’s exactly right: This whole thing has been a trap based on that phony dossier which was based on a phony collusion charge. All this… You know, I’ve blown a gasket two days in a row on this. You know how livid I am. I’m about ready to explode over this whole thing. Nothing in this is real. You know, I think if an investigation was legitimate and if there were a legitimate crime being pursued, then that course of action would carry great risk. But this is nothing! Folks, this is totally bogus. Trump can go on TV, he can do rallies, he can spend as much time as he wants explaining how the very the beginning of this is phony baloney; there’s no reality to it. There was never any collusion. The dossier was created by Hillary; paid for by her team. It was written by people that hate Trump and love Obama. It’s one of the greatest opposition research tricks ever. In fact, this may be the biggest scandal in Washington history, if the truth of this is ever known. This dwarfs Watergate and whatever other scandal you can think of. This is dynamic how a fake dossier and a phony premise has led to the ruination of one life and maybe more, as many scalps as they can get. Shutting this down would not be obstructing justice. Shutting this down would be preserving the Constitution and eliminating a bogus political operation. FLEITZ: My friend Michael Ledeen said this today, that General Flynn may have copped a plea to this particular instance of lying to the FBI to save his family the pain of hundreds of thousands of dollars of legal bills concerning his dealings with Ukraine and Turkey and other things. You just can’t beat the U.S. government with its limitless resources. That’s Ledeen’s position, and I believe Ledeen. RUSH: I know Michael Ledeen. He’s a great guy, very bright, very patient. Barbara, his wife, too. They’re fine people, and he’s right on the money here. And he’s right, you can’t beat ’em. I don’t care Gates and Buffett and Bezos combined couldn’t outlast ’em. (interruption) I said all this yesterday. Look, I know I said all this yesterday. But Fleitz is from the swamp, folks. He’s former CIA analyst. This is better than any source the New York Times has ever pretended to have. RUSH: I want to circle back to this Mueller investigation now, because we have a number of things happening in the country that the Drive-Bys are trying to portray as the biggest scandal. Roy Moore’s a big scandal, Trump’s a big scandal. Anything but what they’re doing. I’m here to tell you, as this keeps percolating, it’s difficult for me to really contain my anger over all of this and how it’s come to be, knowing what I know now, that the whole thing is nothing but a Hillary Clinton, Barack Obama, opposition research project dressed up to look like a deathly serious intelligence investigation, that the future of United States depends on it, is such BS. The real collusion is not between Trump and Russia because there’s still no evidence of any. The real collusion that has been uncovered here is the collusion in our Department of Justice and the FBI from the Mueller team, all of whom were and still are clearly colluding to protect Hillary Clinton, to protect the Obama legacy and to bring down Trump. That’s the collusion. The leadership of the FBI has been corrupted. The leadership of the intelligence community has been corrupted by ideology and by politics, by partisan politics. A supposedly independent investigation being run by the most impeccably honest man of integrity in Washington is nothing but a corrupt trap. And the only collusion that has occurred here is the collusion between the FBI and the leadership of our intelligence community and the Mueller investigation, all colluding to protect Hillary and to bring down Trump. That’s the real scandal here. And I think it is one of the biggest political scandals certainly in my lifetime. I don’t know of every political scandal in this nation’s history, so I’m guarded when I characterize it as the biggest scandal in history. I clearly don’t know. But I’m telling you, this is so bad that even ardent Never Trumpers are being forced to write about this in truthful ways as to what it is. Ardent Never Trumpers are being dragged into this having to defend Trump. That’s how bad this is. It’s how obvious it is. It is a huge scandal that is undermining the Constitution. It is undermining the rule of law. It is undermining the public trust in the government of the greatest nation on earth. And it’s all being done for partisan political purposes, none of which should surprise any of you in this audience because I’ve spent the last number of years telling you every day who these people are and what they are capable of. We have weaponized — we haven’t. Let me rephrase it. The Obama administration has weaponized the FBI, weaponized the CIA, weaponized the NSA, and weaponized the IRS against Obama’s political opponents, which happen to also be Hillary’s political opponents. And it only got worse after Trump won. Obama weaponized the IRS with Lois Lerner. Now the IRS is joined by the FBI, the CIA, and the NSA, the leadership, being weaponized to, A, deny the results of a duly constituted and legal federal election, number one. And number two, to thwart the duly elected president and his agenda, all for the purposes of preserving the absolute mess and disaster that was the Obama administration for eight years. We have been witnessing the FBI and its top leadership and Mueller and some people from the DOJ, Obama holdovers trying to pull off a real life coup here. Now, yesterday we learned of yet another tainted member of the Mueller team, Andrew Weissmann. Now, we’ve known he’s anti-Trump. We’ve known he’s a Never Trumper. We’ve known he loves Hillary for months. He is Mueller’s right-hand man. This is the guy that devised the predawn SWAT team raid of Paul Manafort’s home in Virginia. We learned and we mentioned yesterday that Weissmann was writing mash notes to Sally Yates. Sally Yates was the Obama holdover, deputy attorney general who refused to implement Trump’s travel bans, proudly and happily. And there she is guesting on Colbert and guesting on the Tonight Show, and she’s become a left-wing celebrity by refusing to implement a duly written and legal executive order from the president of the United States. She’s a heroine! The Supreme Court has since said that every Trump travel ban is fully constitutional and has allowed every one of them to be implemented. But when Sally Yates stood up and became a left-wing heroine, this guy, Andrew Weissmann, was sending her emails, “Way to go, babe. You go, babe!” He might not have put the “babe” in there, but they were mash notes. So this guy combined with Peter Strzok and his mistress makes it unavoidably obvious that the Mueller team is comprised of not faithful and nonpartisan objective law-abiding investigators. There is nothing to obstruct here except a trap! The only thing worth obstructing and stopping is this bogus investigation, which is not rooted in a single crime. RUSH: He’s Reggie in Cleveland. Reggie, great to have you on the EIB Network. How are you doing? CALLER: Thank you. I’ve been a listener since ’89 and I’m a first-time caller. I’ve been for Trump from the beginning and I understand and agree with almost everything he does. What bothers me is I don’t understand two things that’s fine done. Number one, he has the power to fire Mueller, and he also has the power to prosecute Clinton. I don’t know why he hasn’t done it. Toward the end of the program yesterday, I noticed you said somebody else’s opinion or yours was that he’d get a lot of flak for it. Well, they’re not gonna hate him any more than they already do, and we who love him will love him even more. So I wanted you to please explain to me why he hasn’t done that. RUSH: Well, okay. I’ve got about a minute here, but I’ll take a stab at. The answer’s all politics, and it’s related to the 2018 election. Yes, you’re right. Trump could fire any of these people. But impeachment, which is what this is all about, is not a criminal proceeding. It’s purely political. Right now, it is a nonevent because the Republicans control the House where articles of impeachment originate and are written. But if the Democrats win the House in 2018, you can guarantee that Trump will be impeached, not that he’s gonna be convicted. The trial’s in the Senate. They need 67 votes. The thinking probably is that if he fires Mueller that he’s falling into a Mueller trap, which I think this news yesterday about the subpoena for Deutsche Bank financial records… ‘Cause Trump has said, “You go there and you’re gone, buddy.” He drew a red line to Mueller, and Mueller may be trying to bait him into firing him because that would then help them in the media create this picture that Trump is standing in the way of justice, that Trump’s trying to hide what they’re trying to find out. Politically, that might facilitate the public being more open to Trump as a problem who needs to go. That’s what they’re guarding against here, I think. But there are other ways of doing this, because of that. But I’m out of time, so you have to wait.